Well now I might be able to start doing that again! Wendy's has a great PDF for us Celiacs here on its website. This is great information, especially for people who travel frequently -- I know how frustrating it is to be traveling and always have to think ahead. Now with this information, you know that there are at least some gluten free options at Wendy's. I'm going to pretend like these burgers are without the bun! Of course, as always, be careful of cross contamination if you are highly sensitive. P.S. 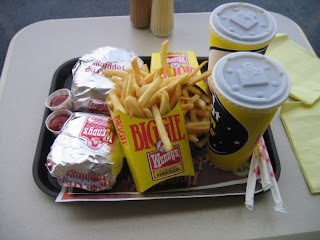 I'm not sure why I've been on such a fast food/chain restaurant binge recently, but I'll chalk it up to finals stress. Look for more L.A.-based recommendations post-May 14th! From what I understand, don't the fries contain gluten? I just quick checked Wendy's site again, because I was thrilled to find some fast-food fries that didn't have gluten. According to their site, the fries aren't on the gluten-free list. Just wondering.